Today I got in a "new" UltraFire SRK - the U-6L2 model in gray w/blue bezel. I was hoping from all the positive comments on it, it was going to be moddable so took a chance and ordered one, though didn't know what I'd do about the switch. I don't have, or ever had, a 6X, so thought I'd try one. I bought and ordered it direct from UltraFire.com, paid their listed price of $38 shipped to US from here: http://www.ultrafire.com - U-6L2, ordered Mar 26th, arrived April 13th. Figured I'd be guaranteed to get the true original UltraFire and not a clone. Wait - I thought Ultrafire was a clone brand? Well, it is many times, but there actually is a true UltraFire brand out there. Apr 14 Updates: the gray finish and styling is maybe the best I've seen in any SRK clone. I don't know how the anodizing will hold up, but it looks very nice, overall feel with the knurling panels around the body is grippy. There does appear to be a solution for a driver update, using the switch and perhaps one segment of the digital LED display. It seems do-able with Narsil on a 17 or 20 mm driver. It's just too nice of a look'n light not to make a go of it. Not shown in a pic yet, there is only one screw securing the MCPCB to the reflector, and it's not centered - just one side. for driver replacement, how do I get control of the e-switch button with a custom 12 wire super thin ribbon cable? Well, can tap into the 12 pin ribbon connector, or traces coming out of the connector for an e-switch signal, and possible use of 1 segment of the 7 segment display. there's no shelf. Thought it was mentioned these lights had a shelf - can't find the post now. 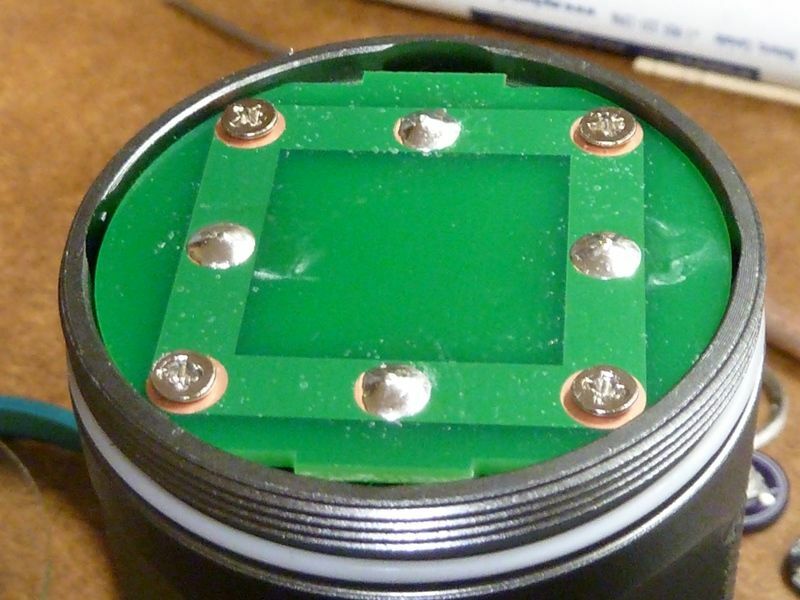 Combine this with a thin LED board (1.93 mm thick), a super thin glass lens (1.32 mm), flat bottom reflector (makes it difficult to use regular 16 mm DTP MCPCB's), and there's not much room, height wise, to add in a shelf of any substance, if at all. This is pretty decent output, in very CW of course. It's pretty warm at 30 seconds, and a 575 lumens drop, 16.9%, in 30 seconds is pretty significant, though could be expected for a thin aluminum MCPCB with no thermal grease, no shelf, assuming it's not DTP as usual. Maybe on Samsunq 30Q's it would do better, but the extra amps would produce even more heat, so the output drop would probably be steeper. I'd love to send a somewhat direct email to that email address printed on the MCPCB, expressing my disappoints with this light, but I'm sure I'll get nothing more than a polite response, saying we are sorry, and what is your question? Main purpose of starting a thread on this light is to have some relevant source of information on these lights for those considering buying one, and also get more feedback from those that have them. I'm not sure - maybe the 6X versions are worse than the 4X ones, or maybe earlier models were done better. I'd have to admit the switch problem was totally on me - I was taking the gamble it could be worked out fairly easy, but I thought I was buying a quality made SRK clone that had a shelf for the MCPCB. I suppose comparing to other SRK clones out there in stock form, this one does pretty good for output. For example, the 12X gold one I bought in Jan 2017 did 2,700 @start, 2,210 @30 secs. Lower output and slightly higher percent drop in 30 secs: 18.1%. 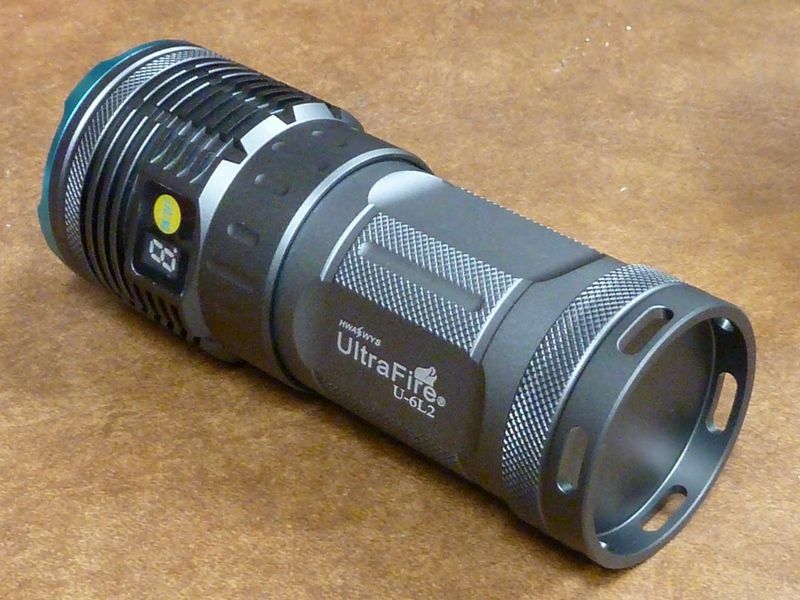 There are some merits to this UltraFire light. The light comes in a plain brown box with no markings, and not even a manual. It does have a card though with some coupon codes that expired in 2016... I guess CE approval is out of the question . Hhmm. The output seems a bit disappointing, compared to a certain group buy flashlight I can think of. I gotta think a bit more on this one. 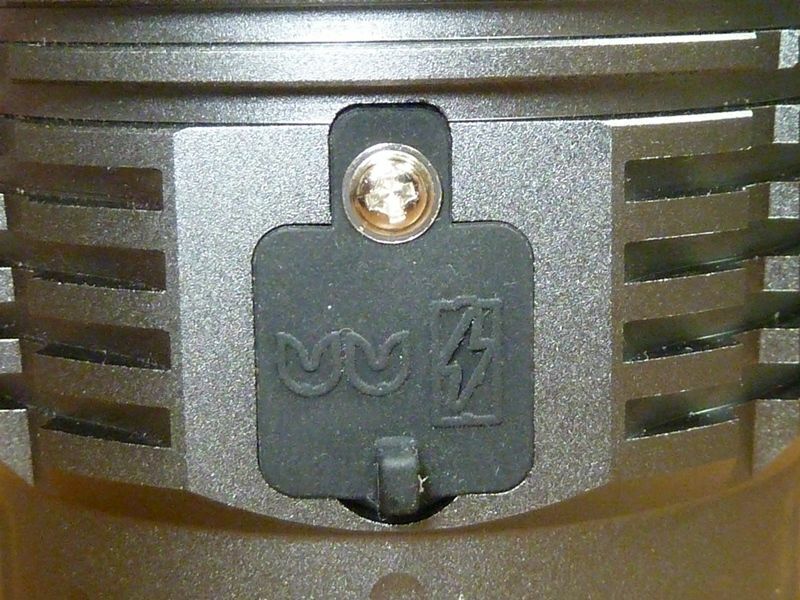 If I piggyback in a good 17 mm driver, and can trace down the e-switch signal, tap into the switch trace from the connector, that might be pretty do-able. For the LED's, will have to keep the stock lens, could go with a thin copper plate that has a thicker back piece that drops into the pill area perhaps. I could also sand down Noctigons a bit, get them down to ~1.2 mm thick. Might pick up enough to go with a 0.5-0.7 mm shelf, or maybe a bit thicker, just sand down the edge that hangs on the ledge of the body. There's some thoughts... Without precise machining though, might not work out well thermally. Yes, as it should be . Not expected, but was hoping for a better mod host. I love the mode indicator. If it could be made to work with the BLF drivers, I’d get it and install a press fit plug for the MCPCB. I don’t see the point of modding it if I have to choose between being able to pick my modes or keeping that LCD. I also do like the idea of the LCD display. They are using an unmarked 14 pin MCU with probably 12 I/O pins. I count maybe 8-9 signals from the switch/display going directly to the MCU. Actually we are looking at Atmel ATtiny MCU's that could handle that many I/O signals. 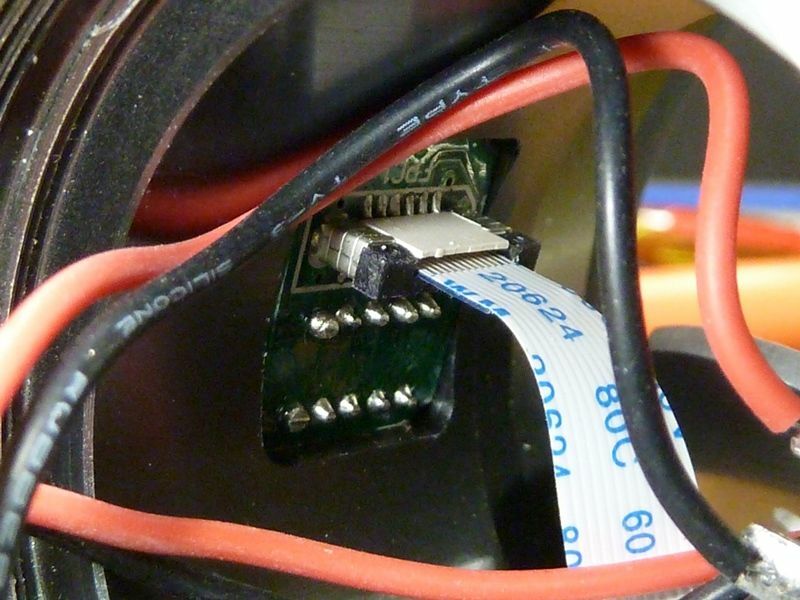 Staying with the ATtiny family makes the port of the drivers easier. Not sure how well they actually use that display though. Do you understand how it works? I got mine in pieces right now. I think it momentarily indicates the mode, then changes to a numeric display to show the charge level of the batteries -- not sure of this though. I think it momentarily indicates the mode, then changes to a numeric display to show the charge level of the batteries — not sure of this though. 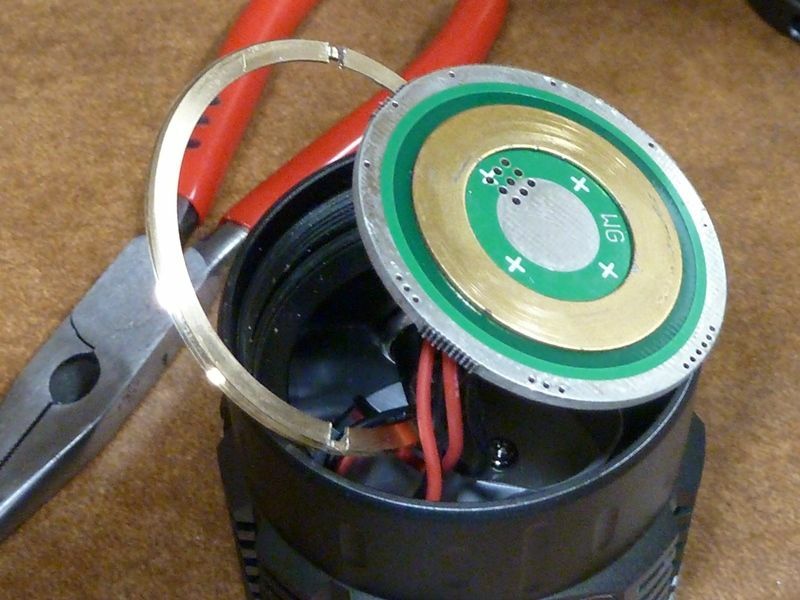 Confirmed - just re-assembled the light. 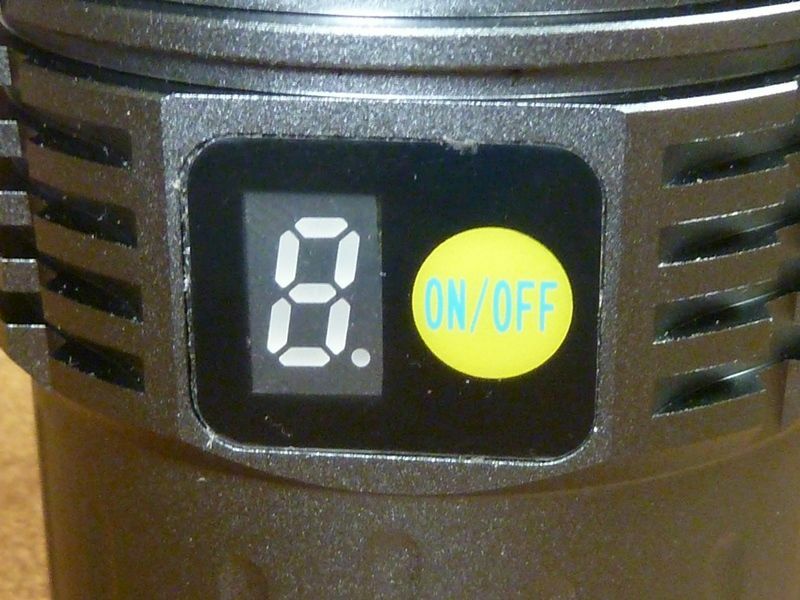 A cell at 3.4V showed "5" on the display, full charge cells show "9". After changing modes, "H" for Hi, "E" for mEdium, "L" for Low shows momentarily, then battery level is shown. Updated the OP with more pics. Really nice looking light, I like that color compared to the others in the lineup. Sad about the no shelf though. And the non standard pcb means the option of replacing that with a nice heavy dtp copper board won’t be happening either. don't think the mode display of "H", "E", "L" help much. If the light is on, you can't tell what mode it's in because the battery status is displaying, not the mode indicator. Also displaying the mode only when the mode changes is kind of redundant - it's obvious clicking thru from OFF. It only has value if you are already ON, and change modes going down - then at least you can see what new mode you are in, but that just seems somewhat limited use with only 3 levels. I considered one as an intro to SRK lights. It is a nice looking light though. Probably good that I paid for a $20 light and got what I got rather than paying more. I did recently order a Manker MK41, it’s not really a SRK, and that’ll be it until the Q8; which will probably ruin me for lights of this sort of form factor for some time. I’m so glad I didn’t pay more for the UltraFire after reading this review. Hmm, like the looks for sure! Does the indicator work like the Uniquefire 1401? The H, sideways M and L are the same. But the 1-9 in the 1401 is more to show how long you got then actual voltage so a 2 in high becomes a 8 for example in low with the same voltage. I have modded such a flashlight, because of a dead driver. I used individual wires to the switch and display.For the display I used the first digit after the point from a Voltmeter. And I used a Nanjg AK47 with FET Mod and star momentary Firmware. Hmm, like the looks for sure! And lumens also nice. Does the indicator work like the Uniquefire 1401? The H, sideways M and L are the same. But the 1-9 in the 1401 is more to show how long you got then actual voltage so a 2 in high becomes a 8 for example in low with the same voltage. Didn't verify this - can't check til tomorrow maybe. Sorry, only quickly checked a partially drained cell. I have modded such a flashlight, because of a dead driver. I used individual wires to the switch and display.For the display I used the first digit after the point from a Voltmeter. And I used a Nanjg AK47 with FET Mod and star momentary Firmware. Ok - this is interesting, and good news! That's cool using the display, but not sure I understand. Probably used just a segment of the digit? Think these simplistic panels work that way? I think we used to call these 7 segment displays, because each of 7 segments could be individually turned ON/OFF, and could make any digit of 0-9, and many letters, for example: C, E, F, H, J. Letters like A, M, or N could not be made because of the 45 degree strokes. Letters like B, D would be confused with the digit 8 or digit 0, so not practical. If you have any pictures or info on pin definitions, please post. Also can you confirm the one you worked on had no shelf? Thanks for checking this light out! Any info on the ledboard? 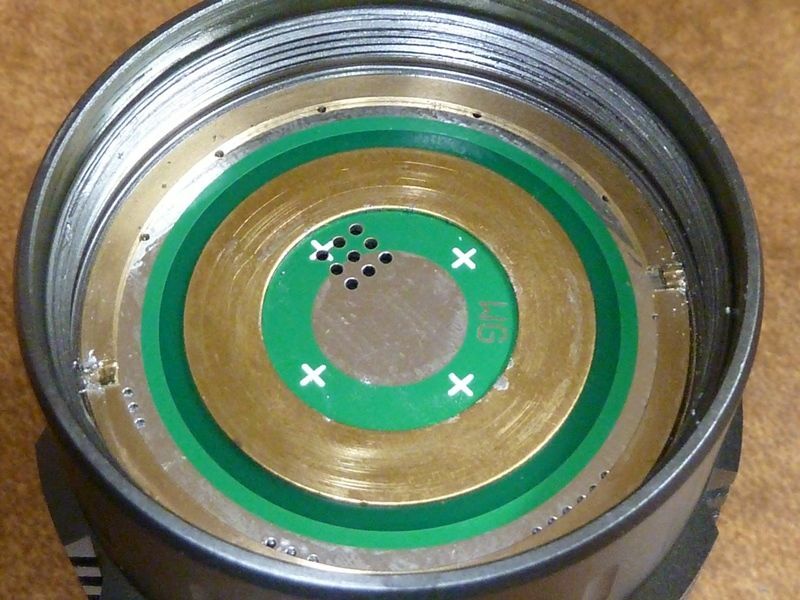 How thick are the traces, especially close to the solder pads, where the most current will be? Will they handle more current? Non-dtp is alright up to 3.5A per led, so 21amps, if the ledboard is backed up with a copper plate and it sits well on its shelf. 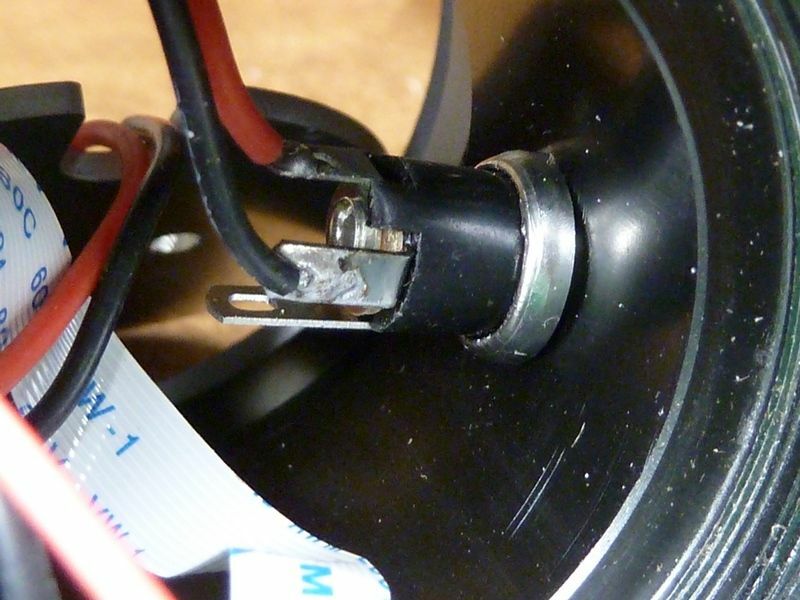 And you need to drill some clearance for thicker wires into the reflector. Thanks for checking this light out! Any info on the ledboard? 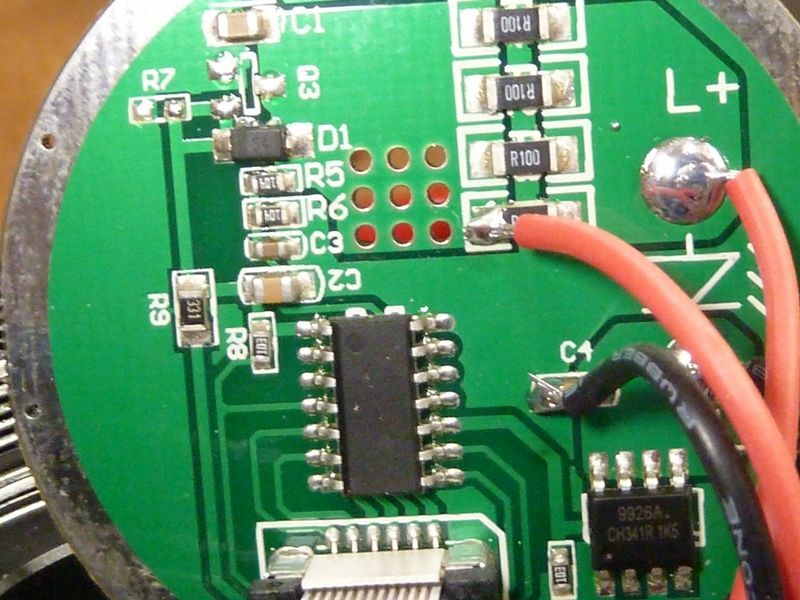 How thick are the traces, especially close to the solder pads, where the most current will be? Will they handle more current? Non-dtp is alright up to 3.5A per led, so 21amps, if the ledboard is backed up with a copper plate and it sits well on its shelf. 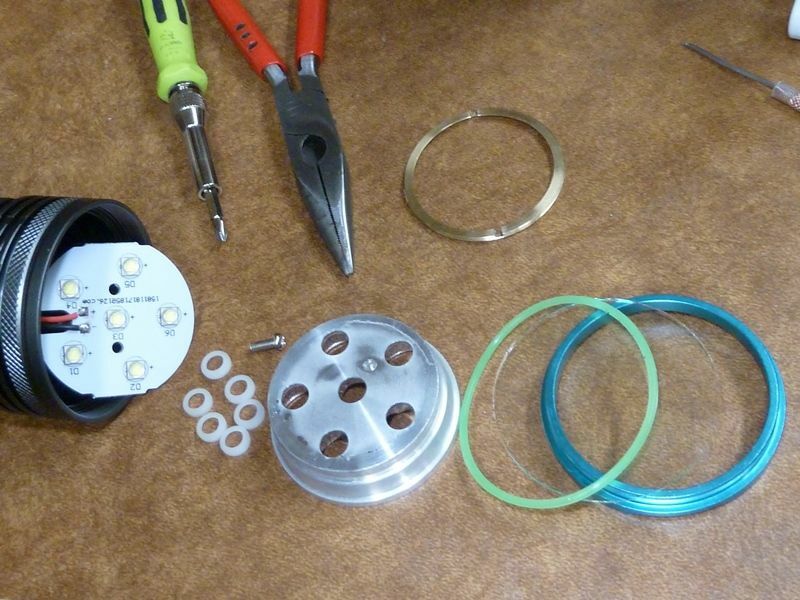 And you need to drill some clearance for thicker wires into the reflector. Can't tell bout the traces yet - could check it out this weekend. In one of the pics, appears to be pretty thick on the left side. Think there will be clearance for thicker wires, but would have to verify. 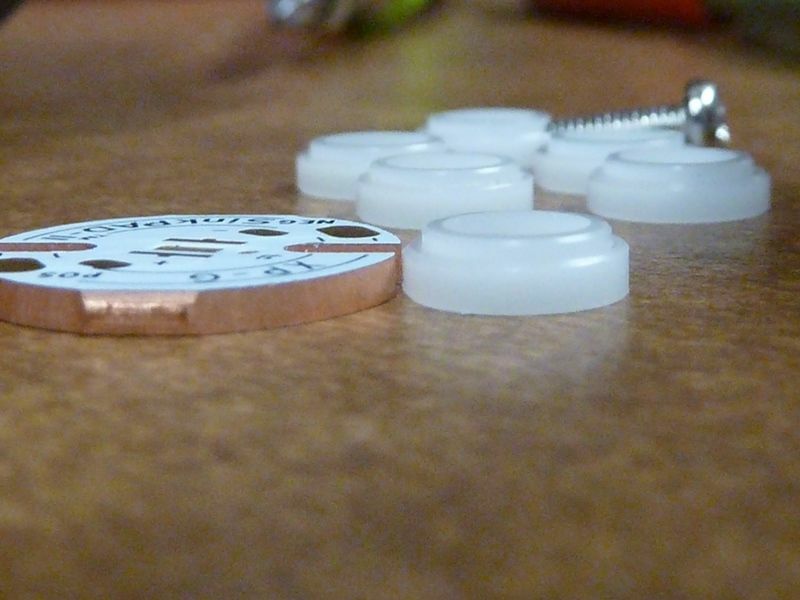 The LED alignment pieces give you 1.6 mm of clearance, if I left them as-is. Does that 3.5A per LED rule still apply to these multi-LED boards? Think'n a lot more heat going around on that LED board, then if it was a single. Though the board is somewhat thick at 1.93 mm, I've seen thicker ones used in these SRK clones. I was planning/hoping to do full LED/copper DTP replacements. I think I could definitely work out a driver piggyback solution using the switch and a single segment of a digit display. 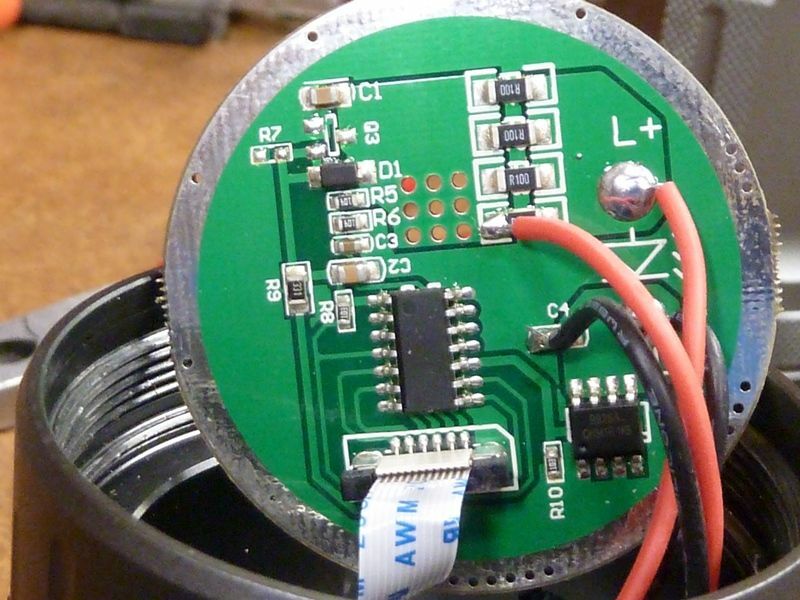 I see they have a 330 ohm resistor on the batt+ lead feeding the 12 pin ribbon, so think'n I can leave that circuitry in tact on the stock driver. That driver retainer ring is real tough to work with - it's hard to tighten without twisting the driver - gotta figure a better way. The more I look at this light though, the gray finish and styling is maybe the best I've seen in any SRK. Not a fan though of the blue bezel, though better than red - might strip it down and polish it up. Shame it has the waste of a charger, and the screwed down rubber cover. What's good bout the rubber cover though is you can feel the bump near the bottom so you can position it in your hand for the switch easier. Gotta update the OP. Does that 3.5A per LED rule still apply to these multi-LED boards? Think’n a lot more heat going around on that LED board, then if it was a single. Though the board is somewhat thick at 1.93 mm, I’ve seen thicker ones used in these SRK clones. I was planning/hoping to do full LED/copper DTP replacements. That may be better after all. 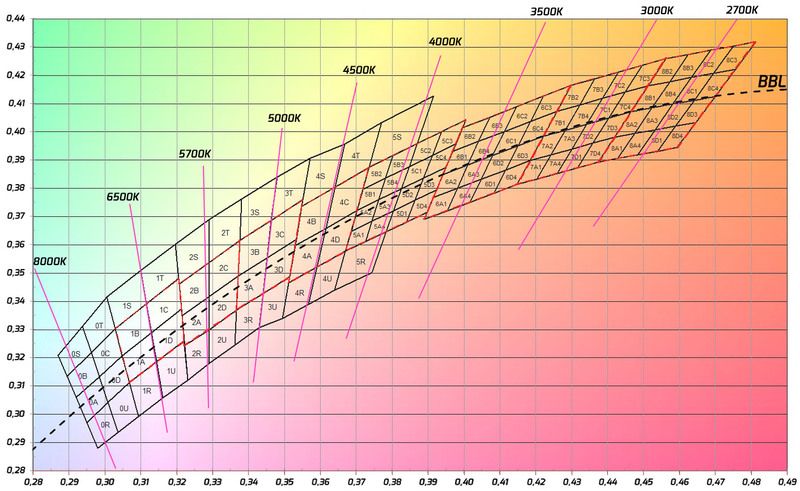 I think that the 3.5A per led does easily apply for 5 out of the six leds if the ledboard is pressed well on the shelf with some thermal paste in between, but the middle one may just die because its heat path is very much worse than the rest. I received a 7 emitter version with the orange bezel. 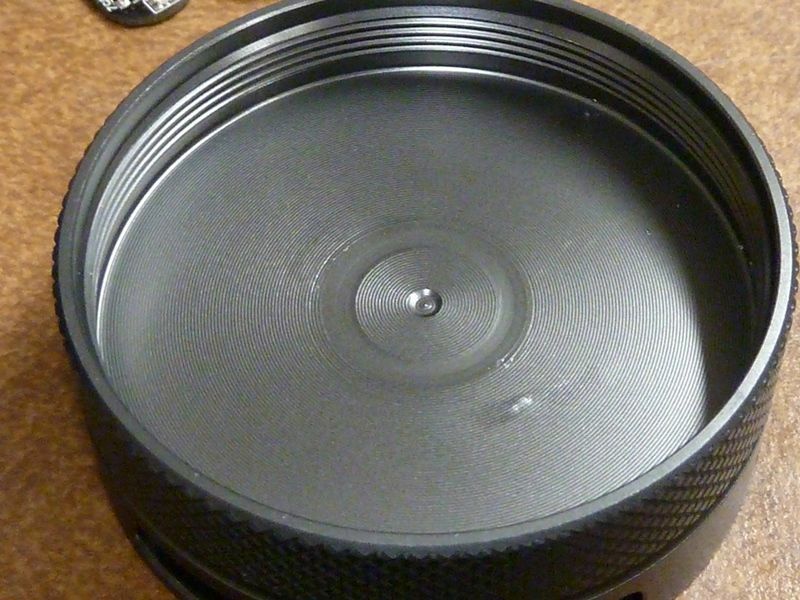 Your OP is consistent with mine too, even down to the 1 screw on the reflector. Thanks for creating this thread. I think many of us will have some fun with this light and this will be a good place to share ideas. Currently, I plan on using a 7135+FET type driver and finally trying Narsil. 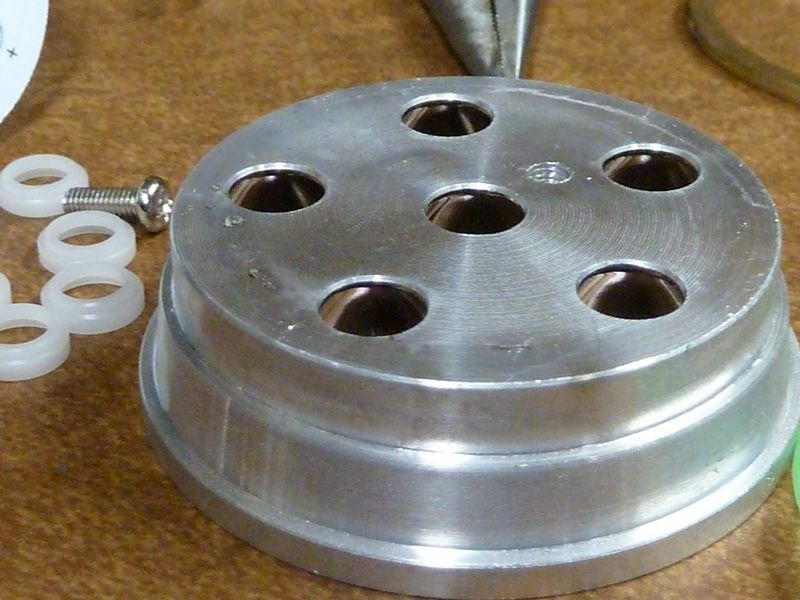 Replacing the tall isolater rings with very thin ones should provide adequate room for a copper plate behind the MCPCB. Hoping that makes the beam floodier as mine is pretty focused the beam pattern is unnatural looking with a distracting overly defined hot spot. I think the tall isolaters are blocking some of the light output. I'll drill and press copper slugs into the thermal pads. Want use one of the leds in the display as an always on location assist. Probably the middle led. Will they handle more current? Non-dtp is alright up to 3.5A per led, so 21amps, if the ledboard is backed up with a copper plate and it sits well on its shelf. Almost sprayed my drink on my monitor. Thanks Tom. Ok – this is interesting, and good news! That’s cool using the display, but not sure I understand. Probably used just a segment of the digit? Think these simplistic panels work that way? I think we used to call these 7 segment displays, because each of 7 segments could be individually turned ON/OFF, and could make any digit of 0-9, and many letters, for example: C, E, F, H, J. Letters like A, M, or N could not be made because of the 45 degree strokes. Letters like B, D would be confused with the digit 8 or digit 0, so not practical. I want to explain it better: The Voltmeter had 3 times 7 segments to show the voltage. I used only 7 segment. For 4.1V the display shows 1. For 3.6V it shows 6. I was searching for datasheets that fits the Display of the Flashlight and the Voltmeter. I tested the displays with very bad NiMh batteries in a 3S carryer or I used my multimeter with resistor test. After finding the correct datasheets I has written down the needed connections. 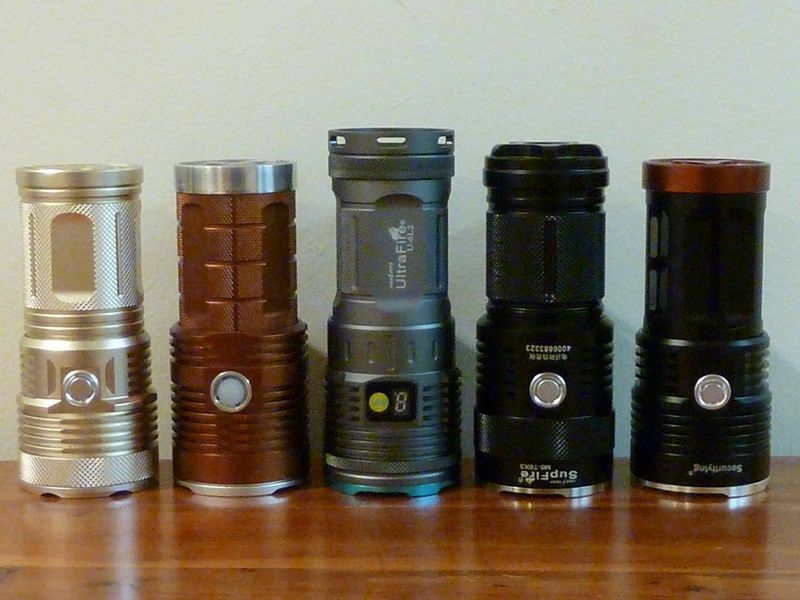 I do not have the flashlight anymore. 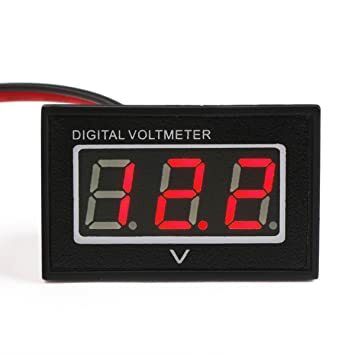 I see, you bought an aftermarket small digital voltmeter that had 3 digits displayed. A cheap one like this for instance. Each digit was the same 7 segment style as the flashlight display. Then you jumpered the 7 or 8 wires that lit up the 2nd or 3rd digit (the one displaying tenths of a volt) to the flashlights single digit display. Interesting. I have an identical un-branded 9-emitter clone of that light since back in June of 2016, that arrived DOA from DX. ( the one i have the driver arrived dead. I am modding it with a mechanical clickie side switch, Nanjq Q-Lite driver, and nine Nichia 219B or C emitters in place of the 3535 no-name LEDs it came with. Guessing mine doesn't have Crees, but a at $20.01, I just wanted the bones. Just wanted to say that I am one of the members who originally bought one of these UF SRK style lights some time ago & rated it highly for the price. In fact myself & Teacher got a 4 led version each & were very impressed with them. In the last couple of days Teacher has got a 9 led version & I have a 7 led version on it“s way which should arrive this coming week. 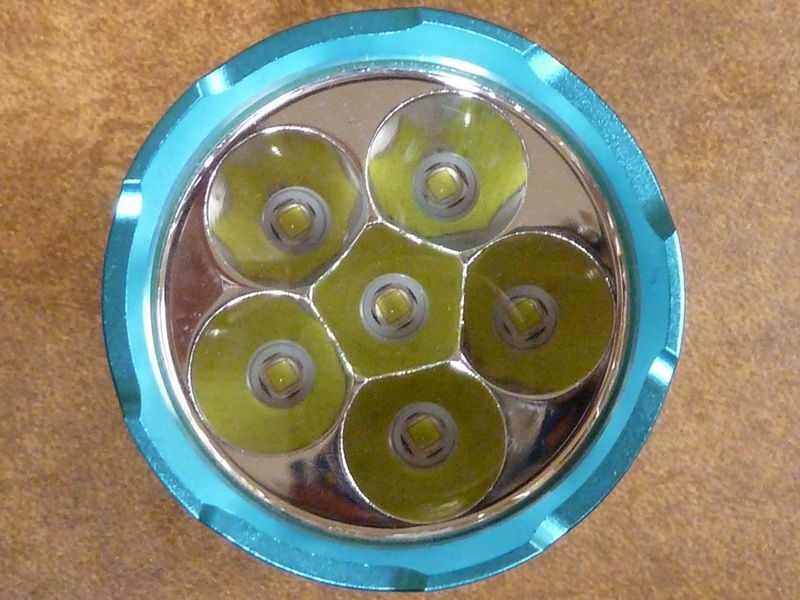 Teacher has confirmed that his new 9 led version is not the same quality as his original 4 led version. 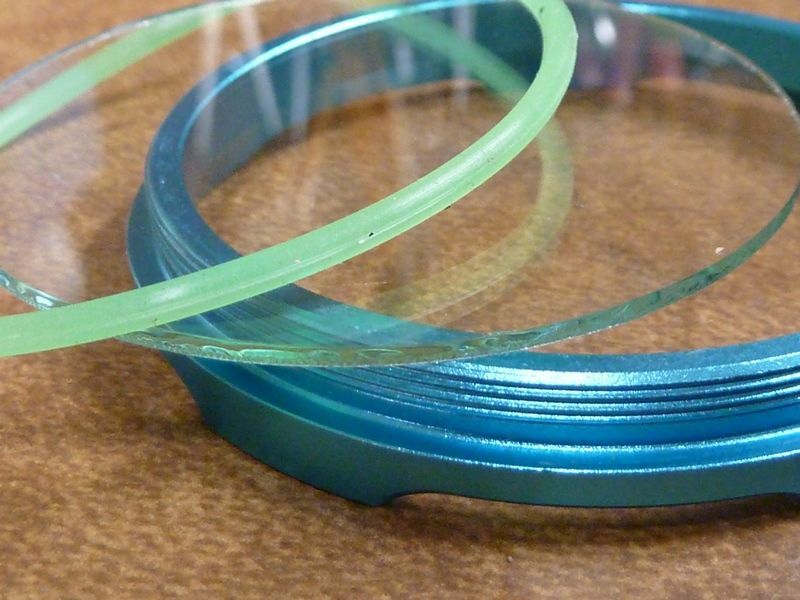 Thinner rougher threads, not the same chunky raised positive contact ring. I expect my 7 led version to be the same. It seems that UF has reduced the quality of the components/build in these lights. Wut? $20? Where did you get it for that price? That's a great price for this light. at DX, they are close to double that. Just wanted to say that I am one of the members who originally bought one of these UF SRK style lights some time ago & rated it highly for the price. In fact myself & Teacher got a 4 led version each & were very impressed with them. In the last couple of days Teacher has got a 9 led version & I have a 7 led version on it"s way which should arrive this coming week. Teacher has confirmed that his new 9 led version is not the same quality as his original 4 led version. 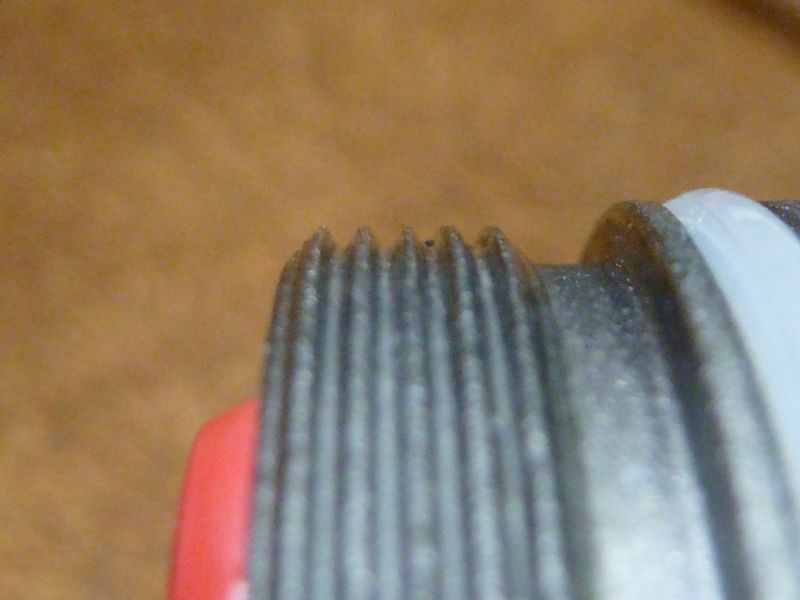 Thinner rougher threads, not the same chunky raised positive contact ring. He has not stripped it yet but I expect the shelf has gone as well I expect my 7 led version to be the same. 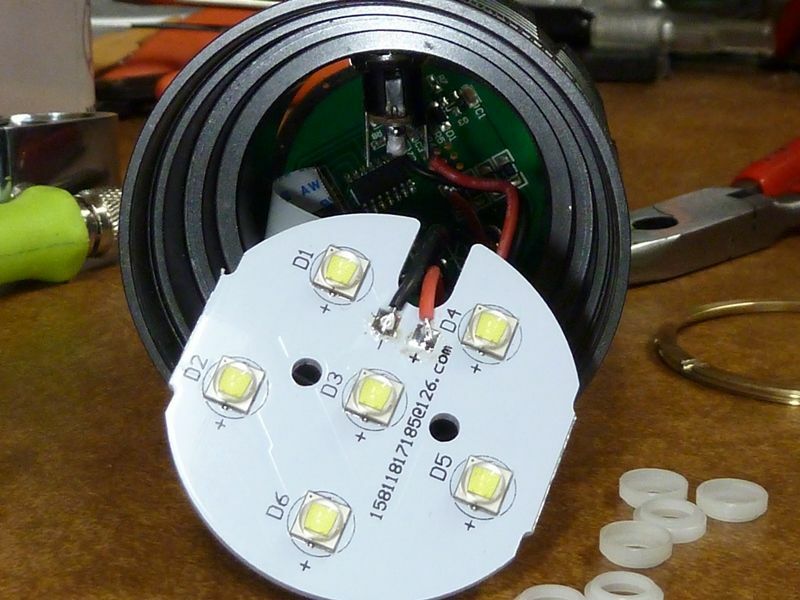 It seems that UF has reduced the quality of the components/build in these lights. Thanks for the info! This is interesting. I thought this light caught on with a small group, just couldn't find the posts/threads. If you have or find any photos of the earlier or later versions, please post in this thread. 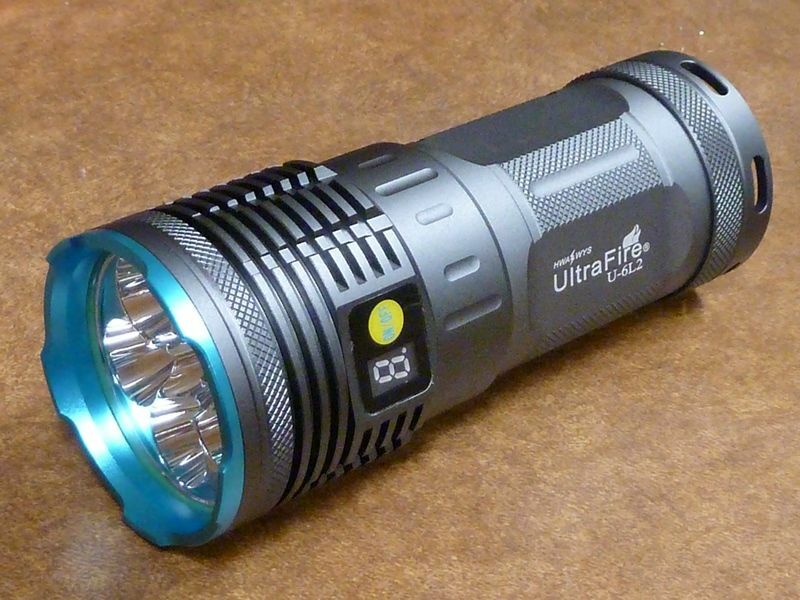 Isn’t a big issue that there is “Ultrafire” the brand that makes not too bad flashlights and the name just being slapped on anything thus can be any quality, usually poor? The use/abuse of the UltraFire name has been going on a long time. Couple years ago UltraFire tried some legal action, maybe a notice sent out to retailers to stop selling UltraFire clones. Banggood did the right thing and pulled all their UltraFire branded items, but many either ignored it or didnt' receive it. The UltraFire site used to have a posting about the problem, but I can't find it anymore. Dated, maybe last updated 2013. Products seem old, no pricing, descriptions or ordering. They seem to be called: Wha Fat Technological Co., Ltd.
Much more current, has pricing, descriptions and accepts orders - this is where I ordered my 6X from. Still has broken links, links that don't takes you where you expect, but they do respond to service/ordering messages. Patents are list on "Contact us" page. The sites list different addresses, different numbers, etc. Seem totally unrelated, but who knows.